Known as the “Painter of Light,” Thomas Kinkade was one of America’s most collected living artists for decades until his untimely passing at the age of 54. Kinkade once said he had something in common with Walt Disney and Norman Rockwell: He wanted to make people happy. Kinkade’s idyllic, fairy tale-like cottages and landscapes exist in a world of beauty, intrigue, and adventure. His paintings and limited-edition works continue to adorn more than 10 million homes across the world. Thomas Kinkade was born on January 19, 1958 in Sacramento County, California, and grew up in the small town of Placerville. Kinkade used his artistic gift as a way to communicate and spread life-affirming values. He wanted his art to be accessible to anyone and everyone, regardless of their artistic background or faith. “Art transcends cultural boundaries,” Kinkade said. Kinkade was mentored by his neighbor, a retired professor from the Art Department at University of California at Berkeley, Glenn Wessels. It was Wessels who encouraged Kinkade to attend the University of California at Berkeley and, in 1976, after graduating from high school, Kinkade took Wessels’ advice. Two years later, Kinkade transferred from UC Berkeley to the Art Center College of Design in Pasadena, California. Kinkade was perpetually short on money and never graduated college, yet he managed to save enough to spend $400 at Moe’s, a popular used bookstore in Berkeley, so he could study master painters. One of Kinkade’s artistic heroes was Pop artist Andy Warhol, but Kinkade wanted his own art to affirm social values instead of challenging them. In 1982, Kinkade married his childhood sweetheart, Nanette and, two years later, they began to publish his paintings as graphic works. The couple had four daughters—Merritt, Winsor, Everett, and Chandler—all named after famous artists. 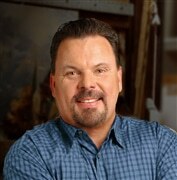 Kinkade created paintings and graphic works simultaneously, offering his originals to galleries throughout California. From 1984 to 1989, he took on the pseudonym “Robert Girrard” in order to experiment with his style, using the techniques of French Impressionists and painted several hundred paintings under that name. By the mid-1990s, his paintings had become wildly popular. Kinkade’s artwork proved to be so desired that, at the time, he sold more canvases than any other artist in world history. According to some accounts, he has sold more canvases than Claude Monet, Édouard Manet, Rembrandt van Rijn, Pierre-Auguste Renoir, Vincent van Gogh, Paul Gauguin, and Pablo Picasso combined. Kinkade unexpectedly died on April 6, 2012, but left behind a legacy of light loved by millions worldwide. His devoted fans remember him for the warmth and joy his paintings have brought into their lives. Thomas Kinkade painted magical imagery that included nature scenes, bucolic gardens, cottages, sports, inspirational tableaus, lighthouses, powerful seascapes, impressionistic cityscapes, and American icons. Kinkade’s works all share similar characteristics: whimsical and slightly surreal pastels and an ethereal sense of light. His Placerville home serves as the inspiration for many of his scenes involving streetscapes and snow. As a self-described devout Christian, each of Kinkade’s works project an image of Christian values. He referred to himself as a “warrior for light,” using light to represent a divine presence within each of his works—a traditional painting technique from the Middle Ages. Through light, Kinkade aimed to drive away the darkness that many people feel, bringing warmth and happiness into their homes. Kinkade left “love notes” in his paintings by hiding the letter “N” as a tribute to his wife, Nanette. His four daughters also had their own messages of love from their father, as their names and images often appear in many of his paintings. Kinkade painted milestone events like Disneyland’s 50th Anniversary, Walt Disney World Resort’s 35th Anniversary, the 50th anniversary of Elvis Presley’s purchase of Graceland, the 25th anniversary of Graceland’s opening to the public, the 50th anniversary of Daytona 500, and Yankee Stadium’s farewell 85th season. Kinkade received numerous awards for “Artist of the Year” and “Graphic Artist of the Year” from the National Association of Limited Edition Dealers (NALED). He was also awarded “Lithograph of the Year” for nine consecutive years. A semi-autobiographical film, “Thomas Kinkade’s Christmas Cottage,” was released in 2008. The movie, starring Jared Padalecki as a young Thomas Kinkade, focuses on how Kinkade began his career as an artist. Thomas Kinkade has been the author or subject of more than 140 books and is a New York Times and USA Today bestselling author. Kinkade published “Lightposts for Living” in 1999 and “Cape Light,” a work of fiction he co-authored with Katherine Spencer, in 2002. In 2000, Kinkade visited the Vatican and had an audience with Pope John Paul II. In 2002, Kinkade was inducted into the California Tourism Hall of Fame for his efforts to highlight the beauty of California. Kinkade was selected alongside artists Simon Bull and Howard Behrens to commemorate the 2002 Salt Lake City Winter Olympics and the 2002 World Series. In 2005, Kinkade was named Ambassador of Lights for the Points of Light Foundation by President George H. W. Bush. The artist raised $1 million for the foundation, $600,000 of which was given to the victims of Hurricane Katrina. Kinkade raised millions for charity, assisting non-profit organizations serving children, humanitarian issues, and the arts. Kinkade’s work with the Salvation Army, the Make-a-Wish Foundation, and the Church of Nazarene propelled him to win numerous awards for his service and painting. The NALED recognized him for his philanthropic efforts with the Eugene Freedman Humanitarian Award. The Make-a-Wish Foundation named Kinkade a national spokesperson in 2003. Kinkade was selected to paint the National Christmas Tree in Washington, D.C. twice—the first time in 2000 and again in 2004—for the annual Pageant of Peace.